The Tree Root is a room inside of the Haunted Towers in Luigi's Mansion: Dark Moon. The Tree Root can be accessed by taking the north door on the first floor of the Hollow Tree. The Tree Root is a long room located underground. The dirt walls and floor have more tree roots growing in them and there are several rocks stuck in the wall. At the bottom of this room is a small puddle of water, a layer of moss with mushrooms, and a green root. The door to the south leads back to the Hollow Tree. There is an elevator to the west that takes Luigi to the Old Graveyard. During Graveyard Shift, Luigi needs to go to the Tree Root in order to reach the Crypt that has the special key. 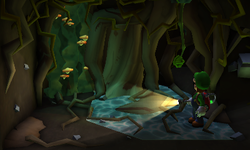 In order to reach the Crypt, Luigi must pull off the moss covering another root. Pulling this root causes an elevator to the Old Graveyard to appear. The other root just causes a spider to drop down.